When we entered the meteorological fall season on Sept. 1, I wasn’t convinced because it was still hot. Then on Sept. 21, we “celebrated” the autumnal equinox. Had we turned the corner to the astrological fall? I still wasn’t convinced. I like watching the plants in our landscapes, including Mother Nature’s garden, to look for clues that the seasons are actually starting to change. 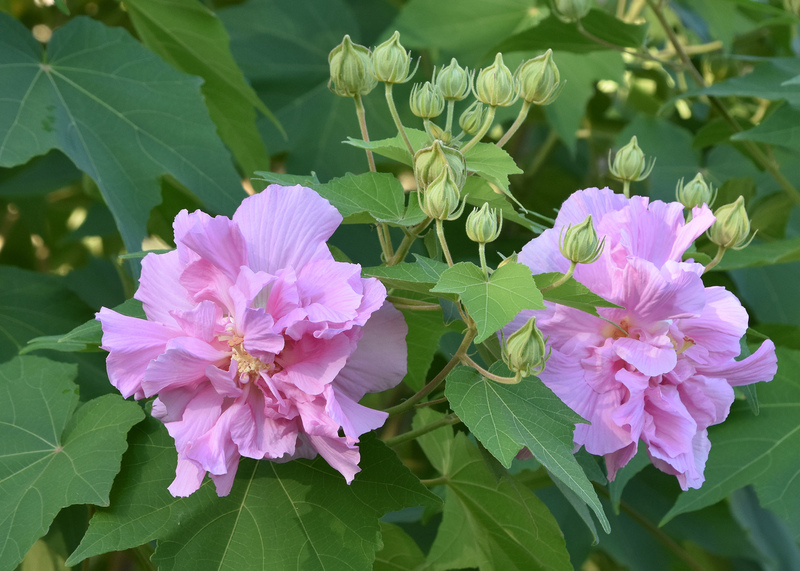 While driving last week to meet with the Choctaw County Master Gardeners, I noticed one of my favorite flowering shrubs starting to wake up across Mississippi. It was then that I realized we were actually going to have a fall season. I’m talking about Confederate rose. During late summer and fall, Confederate rose is in its prime blooming season. This plant is less commonly known as Cotton rose and Cotton rosemallow. 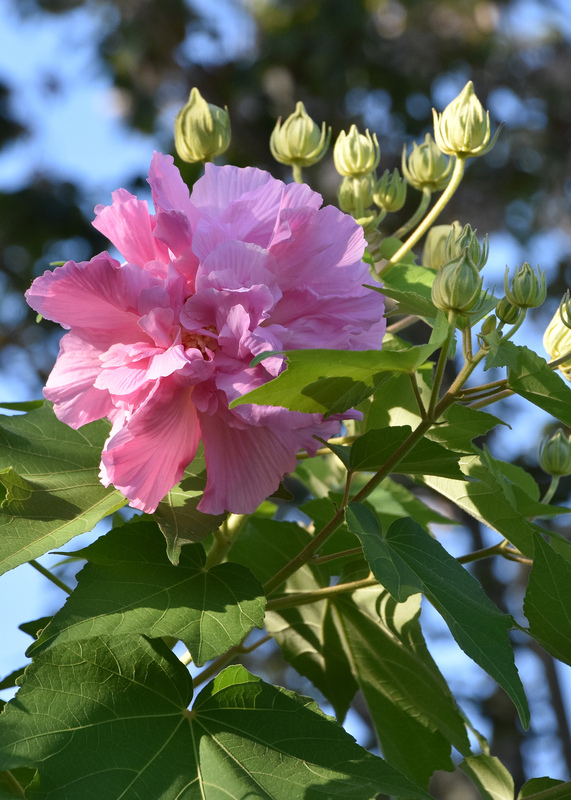 Despite the references to cotton, it is a hibiscus that originated in Asia. It is known botanically as Hibiscus mutabilis, which refers to the mutable flower colors. The flowers open nearly white and then turn pink and finally a bright red as they deteriorate at the end of the day. But not to worry: Each plant produces literally hundreds of blooms. As the old flowers fade, new ones are opening. On a typical day, there will be loads of flowers in varying shades of white, pink and dark pink. And did I mention the flowers are huge? You really can’t beat having these bright, 6-inch blooms in your fall landscape. When choosing a place for this plant, your first and foremost consideration is that it needs full sun. Also consider the mature size of the plant. It is impressive at 10 to 20 feet or more tall. I think the best landscape use is as a specimen plant in order to properly display the gorgeous and prodigious number of flowers. Confederate rose likes a consistently moist planting bed, but it does not like wet feet. 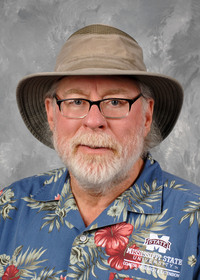 The leaves are large and frequently start to look a little wilty on hot Mississippi summer days. But this plant will bounce back by morning as long as you maintain consistent soil moisture. The plant typically dies back to the ground after a hard frost, except in the extreme coastal counties, where it may overwinter. Confederate rose emerges from winter dormancy to shoot up 8 to 10 feet or more the next season. To accommodate the next season’s growth, which springs up from the roots, cut Confederate rose back to 4 to 6 inches tall in late winter. 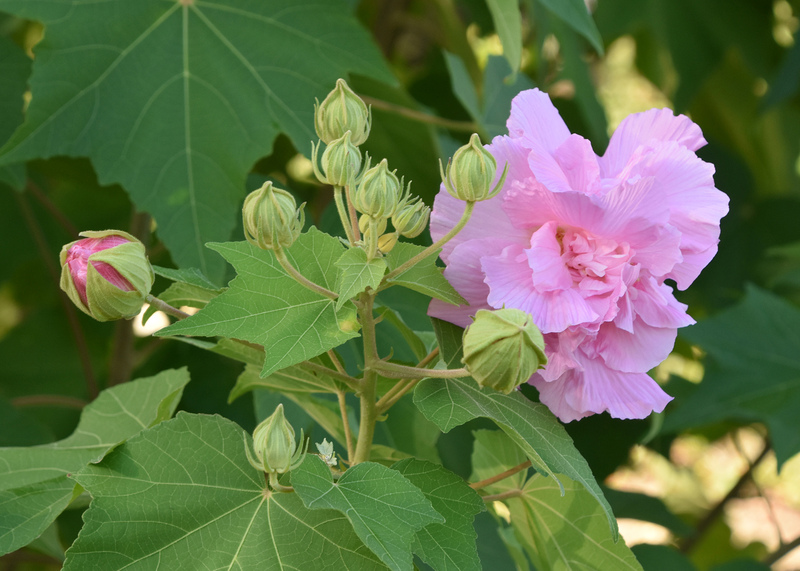 Confederate rose is a perfect example of an heirloom ornamental plant that everyone can enjoy in their gardens and landscapes. Heirloom ornamental plants are also called pass-along plants, and fall is the best time to collect root cuttings. Try placing stems in a glass of water, although I haven’t had luck with this method. Or you can use a little rooting hormone and stick cuttings in a container kept in a shady spot.